Mariha Zaman Khan – Sattar&Co. Mariha Zaman Khan is a Barrister and works with Sattar&Co. 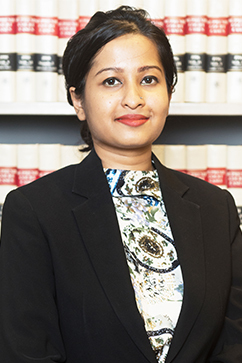 After being called to the Bar, Mariha returned to Bangladesh and started her legal career at Sattar&Co. Mariha assists in advising clients on corporate laws and foreign investment matters at Sattar&Co. She is also a lecturer at a leading law school in Bangladesh.